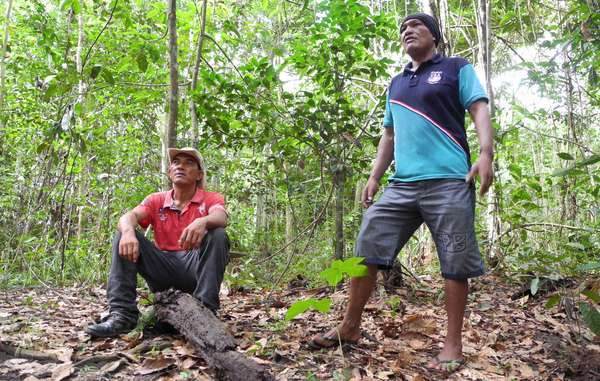 With support from Survival, the Guajajara are able to expose illegal logging and threats to their uncontacted neighbors in real time. Olimpio remains calm, but you can sense tension as he continues to speak. Olimpio is among the leaders of a group known as the “Guajajara Guardians,” men from the Guajajara tribe in Brazil’s Maranhão state who have taken it upon themselves to protect what remains of this north-eastern edge of the Amazon rainforest, the hundreds of Guajajara families who call it home, and their far less numerous neighbors: the Awá Indians, some of whom are uncontacted. Uncontacted tribes are the most vulnerable peoples on the planet, and the Guajajara are acutely aware of this. Whole populations are being wiped out by violence from outsiders who steal their land and resources, and by diseases like flu and measles to which they have no resistance. 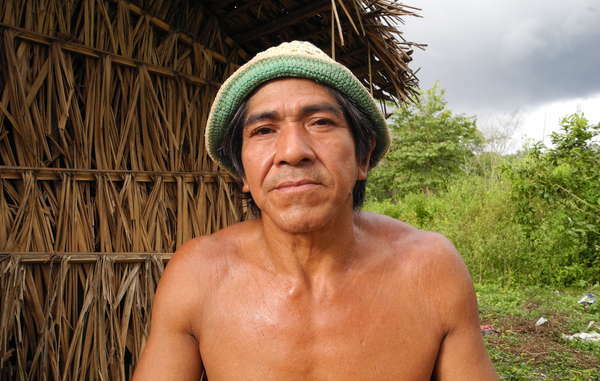 The Guajajara know that the destruction of the forest, which the Awá have been dependent on and managed for generations, spells doom for the Awá and the Guajajara alike. All uncontacted peoples face catastrophe unless their land is protected. Without it, the Awá simply won’t survive. The satellite imagery is startling: this territory, known as Arariboia, is an island of green amidst a sea of deforestation in this corner of the Amazon, which has been plundered for its iron ore; opened up by roads and rail; and chopped down for its valuable hardwoods. 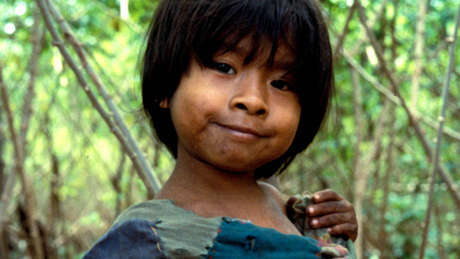 The Awá are one of the most vulnerable peoples on the planet. Some of them have no contact with mainstream Brazilian society, though the majority do. The uncontacted nomadic Awá live on a small hill in the centre of this island, where they hunt, fish, and collect fruits and berries. Its forest cover is thicker than that below. Following centuries of invasion, the Awá’s hill has become their refuge. They now number no more than several dozen. 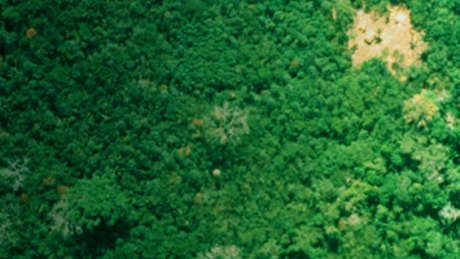 As we looked up towards the uncontacted Arariboia Awá’s forest, it struck me that they really are living on the edge. Following centuries of land invasion and theft, and genocidal violence, they are clinging on against all odds. Preventing their annihilation is a matter of now or never. 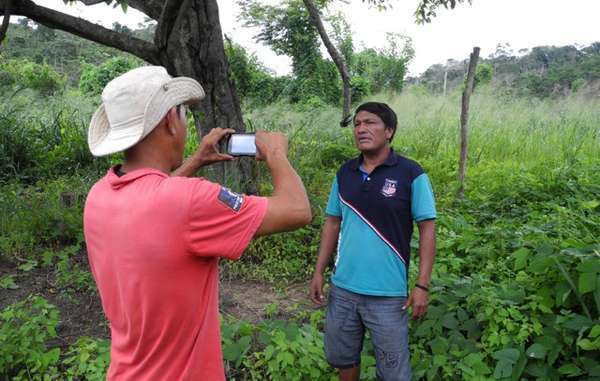 I was here to learn about the Guajajara Guardians’ work and to set them up with communications technology as part of Survival International’s Tribal Voice project, which allows remote tribal peoples to send video messages around the globe in real time. It is one of the ways in which we work in partnership with them, and give them a platform to speak to the world. They were very enthusiastic about the possibilities this might offer, allowing them to expose logging and other attacks on Arariboia, and share information from their expeditions to protect their Awá neighbors. First of all, however, Olimpio decided to record a denunciation of two American academics, Kim Hill and Robert Walker, rejecting outright their calls for forced contact with uncontacted tribes. “It would be another genocide of a people, of indigenous people, who do not want contact, either with us, or with non-indigenous people” he says. It is hard not to be impressed by his determination. Much of this region of Maranhão doesn’t really feel like the Amazon. The state borders the northeastern coast of Brazil and stretches downwards into the Amazon basin, but you don’t see the thick forests that people generally imagine when they picture the world’s largest rainforest. Instead, much of the area has been given over to agriculture in the form of ranches and plantations, or abandoned after the loggers have had their way with it and moved on. After driving through countless miles of bleached brown grass, it is refreshing to reach Arariboia. The indigenous territory is home to the Guajajara and Awá peoples. Arariboia and other indigenous territories in the region are virtually the only remaining areas of genuine forest in the state. Crossing the border into indigenous land, things don’t feel all too different at first – in fact, vast swathes of forest in the territory were destroyed by fires last year, believed to have been started by the region’s powerful logging mafia. But the further into the area you head, the more you get the sense that you are in an island of lush greenery in the middle of the destruction so common elsewhere in this part of Brazil. 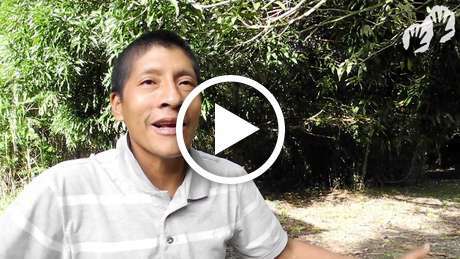 Olimpio and Franciel, coordinators of the Guajajara Guardians, are determined to protect the forest for their uncontacted Awá neighbors. Although it is strictly forbidden under Brazilian law for outsiders to fell trees in indigenous territories, here and elsewhere in the Amazon loggers constantly flaunt this with impunity. Just on the drive up to Arariboia we passed dozens of loggers, their trucks piled high with illegally felled logs. I took a photo of one truck driven by two young men looking particularly pleased with their collection, and realized very quickly that they didn’t care. They do not attempt to hide their faces or their operations as they knew that the local government – largely controlled by the mafias who run this trade – will carry on turning a blind eye. However, it is harder than ever for bandit loggers to operate in Arariboia. The Guardians, of whom there are around fifty, patrol the forest, monitoring, keeping their eyes open, and notifying the authorities. They do it in shifts, in their own time, with only sporadic financial and logistical support from the Brazilian government, despite its formal commitment to protecting the rainforest and indigenous rights. The work is time-consuming and far too much for a small band of committed volunteers. And it’s dangerous: In recent years, several Guajajara have been assassinated. Why then, do they do it? I found it difficult to fathom at first. It is common for loggers to intimidate and murder indigenous people, so many feel forced into silent acceptance of the loggers and their activities. Sadly in this part of Brazil, many Guajajara also collaborate with the loggers, hoping to make some money from the trade, which they see as unstoppable. Alienated, threatened, and living on the fringes of a society that barely accepts them, the Guardians’ motivation for self-imposed vigilante duty is not outwardly obvious. The more time I spent with the Guajajara in Arariboia, however, the more it seemed to make sense. Members of the tribe who live in the center of their land, closest to the Awá’s hill, are less integrated into mainstream Brazilian society, and feel a stronger sense of connection to their communal ways. They thrive in the forest, knowing it intimately and practising Guajajara rituals. While I was there I witnessed one of these – a coming of age ceremony for a Guajajara girl. The tribe considers a girl’s first menstruation to be a hugely significant time, marking the passage into adulthood, and celebrate it as a community. The girl spent a week living in a small hut with a palm frond roof, attended by female relatives who would bring her food. Rather than being a solemn isolation, however, the rite of passage is a great celebration, and the Guajajara frequently burst into song and dance, paint their faces and revel in the girl’s new maturity. The men of the village, though not allowed to enter the hut, often come and stand close to the entrance and join in the singing. Experiencing this put the Guardians’ desire to protect their forest and fellow indigenous people into context. To them, Arariboia is not a resource to be exploited in the name of “progress” and “civilization” – it is fundamental to who they are. They take great pride in it, protect what is left of it, and feel a deep sense of connection to it. Survival has been working with the Guardians since 2015. “People can’t take their land away from them,” another of the Guardians said to me, outraged, as we trekked through the forest close to one of the logging hotspots, “and they can’t take them away from their land.” He was indicating the Awá’s hill, which towers over the surrounding scrubland and lighter forest and provides a focal point in the landscape. The uncontacted Awá living there have expressed their desire to remain uncontacted, and the Guajajara want to see that desire respected. Some see the centuries-long battle for survival between the indigenous peoples of the Amazon and the colonizers who exploit and destroy it as hopeless. Some, including the American anthropologists who the Guajajara were so keen to refute, see contact as inevitable and isolated uncontacted peoples as doomed. Deforestation will continue, they claim, and so tribal people will either have to assimilate with the Brazilian mainstream, or else face annihilation. The Guajajara Guardians see it differently. They know what contact, “development,” and “progress” can mean for tribal peoples. They have watched as more and more of the forest that their ancestors were dependent on and managed for generations has been destroyed. And they’re keen to fight back, by boosting their land protection expeditions which are succeeding in keeping loggers out of some key areas, and by sharing their concerns with the world and encouraging international support. For any tribal people, land is the key to survival. We’re doing everything we can to secure it for them, and to give them the chance to determine their own futures. That’s also why Survival is giving the Guajajara, and other tribes, communications technology so they can speak to the world in real time. Their understanding of the problems they and their neighbors face is as astute as anyone’s and they have perceptive things to say about almost every aspect of life today. They are not only the best conservationists and guardians of the natural world, but are also at the forefront of the fight for human rights and self-determination. Maybe it’s time to listen. Video clip Pire'i Awá – Success! Your support is vital if the Awá are to survive. There are many ways you can help. Donate to the Awá campaign (and other Survival campaigns).